Our hair restoration specialists can treat balding caused by different hair loss causes, which is why so many patients from New York, Boston, and New Jersey come to our offices. One factor that can really have a profound affect on stimulating hair loss is a deficiencies in various vitamins or minerals. We'd like to turn our attention to these issues right now. Keep in mind that you should consult your physician before adding any kinds of vitamin or mineral supplements to your diet. The Journal of Korean Medical Science published a study in which researchers sought to discover the role of iron deficiencies in premenopausal women experiencing female pattern hair loss. The researchers found that while the control group of women did not experience any hair loss, the women who did show signs of female pattern hair loss also showed lower levels of iron in their systems. 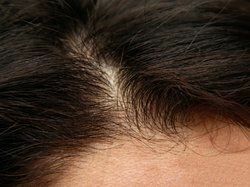 However, the link between hair loss and iron deficiencies remains inconclusive, and makes it a very controversial issue. Although The Journal of Korean Medical Science showed a clear link between the two, not every study shows a link between iron deficiency and hair loss, and to date, there is not enough hard evidence to conclude that iron-deficiency screening a routine procedure for people suffering from hair loss. Dermatologic Therapy published a study in April 2012 in which researchers administered daily zinc supplements to a small group of individuals suffering from hair loss. Within a short period of time, researchers found that the zinc supplements helped patients see improvements or found the condition to be cured completely. Based on these findings, the researchers concluded that the levels of zinc in an individual’s system play a vital role in the growth, or lack thereof, of hair. Additionally, Huntington College of Health and Sciences recommends that an individual’s zinc intake should be around 15 milligrams per day, regardless of gender. The school also claims that many Americans show low levels of zinc in their system, which has a direct effect on the rate in which their hair follicles replicate. Vitamin A: Vitamin A helps create a substance known as sebum, which is important for lubricating hair roots and preventing hair from becoming brittle. Beta-Carotene: Like vitamin A, beta-carotene helps create sebum. Vitamin B-6: Vitamin B-6 helps stimulate hair growth by promoting good blood circulation. Vitamin B-12: Deficiencies in B-12 often contribute to female hair loss. Vitamin C: Vitamin C is crucial for the production of red blood cells, which in turn are important for healthy hair. Calcium: Calcium is not just necessary for healthy bones but healthy hair as well. Vitamin D: Working in tandem with calcium, vitamin D improves the health of your hair. Vitamin E: Vitamin E is another vitamin that's important for promoting good blood circulation. Magnesium: Deficiencies in magnesium have been linked to hair loss, among other health conditions. For more information about hair loss and what you can do to improve your overall health and wellness, be sure to contact our hair restoration specialists today. Our entire team looks forward to your visit and providing you with all the information you need to have a healthy, beautiful head of hair.